Failsworth 'Sherlock' Harris Tweed Retro Deerstalker Hat. A certain Vintage Victorian/Edwardian era flair with classic Country Heritage appeal. A traditional headwear style made particularly famous by Sir Arthur Conan Doyle's Sherlock Holmes. Take note of the Harris Tweed famous orb logo which denotes quality and authenticity. The games Afoot' with this classic Retro Sixties inspired Heritage Deerstalker Hat. Adds a debonair edge to Vintage and Retro Clothing and creates an off the wall feature for Indie attire. Failsworth 'Sherlock' Deerstalker Hat. Headwear to make Holmes proud, 'Sherlock' comes in an authentic Harris Tweed Country Heritage herringbone fabric. Complete with famous Harris Tweed 'Orb' tag - Handwoven in the Outer Hebrides from 100% pure wool. Add the finishing touch to your country heritage Retro Clothing ensemble. Keeping the trademark Deer Stalker features as adorned by the late nineteenth century sleuth himself, this Retro hat is sure to cause a stir. Paying homage to the traditional country gent styling, this fab Mens Deer Stalker hat also has a very distinct Seventies Vintage vibe. Harris Tweed exterior, classic duel brims, to protect both the face and neck of the wearer and the traditional flexible side straps (to be worn tied under the chin in cold weather and high winds). 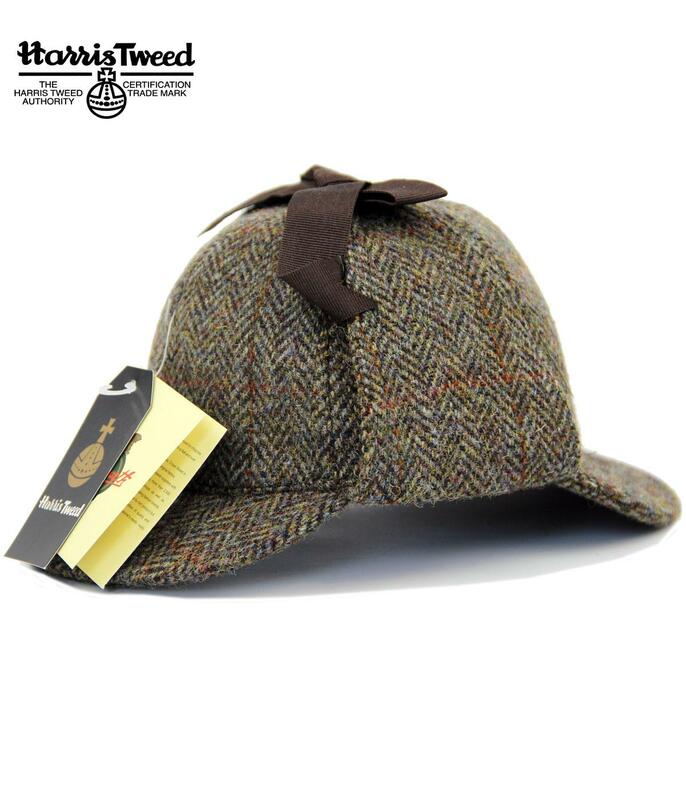 Adds a quirky psychedelic air of authority to any smart or casual outfit, the 'Sherlock' Deerstalker Hat by Failsworth. Key Points: Failsworth Harris Tweed Deerstalker with dual brims, ear flaps and ribbon ties. Care: Lightly sponge with warm, soapy water. Please refer to instructions on label. SKU: 2013 Sherlock Harris Tweed Deerstalker.